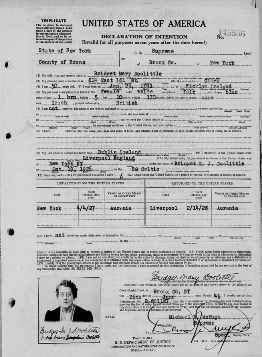 Family Search is digitising the New York (Southern District) U.S District Court Naturalization Records, 1824-1946 collection. The full collection of 2.2million images is now available for browsing, while more than 772,000 images have been indexed for free searching here. When searching the index, be aware that files for some individuals may extend over a few pages, so be sure to scroll through the images either side of the indexed page to find all associated images. Naturalisation records for Irish immigrants, especially those who arrived in the 20th-century, often provide a place of origin in Ireland. The New York Southern district includes Manhattan, Bronx, Westchester and other counties north of Westchester. Find out more about this collection in FamilySearch's wiki here. Thanks to ProGenealogist Joe Buggy (author of Finding your Irish Ancestors in New York City) for alerting me to this development.